Time, Speed, and Distance is a very crucial topic in quantitative aptitude section of CAT, SNAP, XAT etc. Every year 4-5 questions are asked from this topic. We all have done questions based on Time and Distance in our high school maths but you might not be acquainted with this very significant part of the application of this concept knowns as Linear and Circular Races. You might have done some simple problems based on this concept but not enlightened with its model and theory. In this blog, I will provide you a summarized knowledge of this concept along with it’s application in forms of problems. Let’s commend! We’ll start first with familiar with what really is this topic is all about and a few expressions you will come across in problems. A race is a competition in which contestants compete among themselves to cover some distance in shortest length of time. 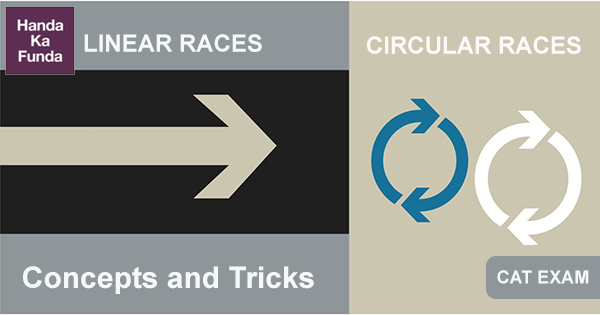 Circular race: In this one the path of the race is circular in shape. Starting point: It’s the point from where the race begins. Winning Point: It’s the end point of the race. Head-Start / A gives B start of x meters When a racer gets a start x meters ahead of the starting point it’s called head-start of x meters. Here A gives B a head-start of x meters. Head-Start/ A can give B a start of t minutes When a contestant gets a start by t seconds earlier than other ones, it’s called head-start of t seconds. Here A gives B a head-start of t seconds. A beats B by x meters When A reaches the winning point before B and is x meters away from B. Then A beats B by x meters. A beats B by t seconds When A reaches the winning point t seconds before B. Then A beats B by t meters. Dead Heat A dead heat is a situation of tie. When all the participants reach the winning point at the same point. Given below are a few examples with the usage of terminologies mentioned above. Example 1: In a 100 m race, A can give B 10 m and C 28 m. In the same race B can give C.
A covers 100 meter in same time as B covers (100-10) meter and C covers (100-28) meter. Using unitary method, we can find out the head-start that B can give to C. Therefore, when B runs 100 meters than C runs (72/90 *100) = 80 meters. And thus, C gets head-start of 20 mtr. Example 2: In a 500 m race, the ratio of the speeds of two contestants P and Q is 4: 5. A has a start of 140 m. Then, P wins by? Sol) In order to reach the winning point P has to cover (500 – 140) m i.e. 360 m.
Since, Ratio of Speed = Ratio of distance covered. Therefore, P covers 4 m while Q covers 5 m.
Thus, when P covers 360 m, Q covers (5/4 * 360) m = 450 m.
=>A win by 50 m.
When do the participants meet first anywhere on the track? How many times do the participants meet? When do the first time they meet at the starting point or ending point? Before moving forth with problems let’s learn some useful tips. When the speed of Y is expressed in terms of X and X and Y are running in opposite direction such that speed of Y is n times of X then no. of meeting points of X and Y are n + 1 i.e. if speed of Y is equal to X then their meeting points are 2. X and Y running in circular track and in opposite direction. If the speed of X is x/y of Y, then the total number of meeting points = x + y. All the distant meeting points are equidistant in circular path and same goes for time i.e. all of them take equal time and are covered in definite manner. A diagrammatic approach is the best technique when it comes to circular path. It will help you visualize the question properly. Example 1: In a circular race of 2400m, A and B start from the same point and at the same time with speeds of 27km/hr. and 45 km/hr. Find when will they meet again for the first time on the track when they are running in the same direction and Opposite direction? Example 2: Ram and Sham are running in opposite direction around a circular track of length 20π meters. Speed of Ram is 33.33% of the speed of Sham. Find straight line distance between their first meeting point and the second meeting point. It is given that they start simultaneously from a common starting point. Sol) Since speed of Ram is 1/3 of Sham. Therefore, the no. of distinct points are (1+3) i.e. 4 points. 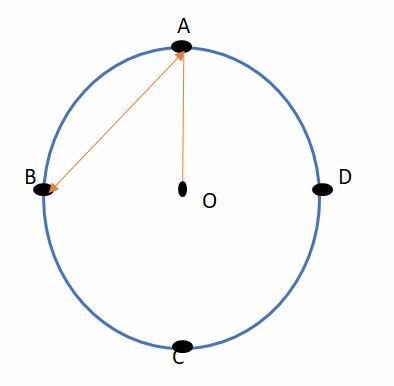 Circumference of the circular path is 20 π then the radius of circle will be 10 m. Thus, using Pythagoras formula we can easily calculate the length of AB i.e. 10√2 m.
The above problems are few examples of the application of this concept. There can be many similar and varied problems based on both Linear and Circular race. To solve them you just need to interpret the language correctly and find the solution to the problems using the tips I have told you in this blog along with what you have learnt in your junior classes regarding Lines and circles. You will get a thorough understanding of this topic only if try different problems and practice its application.